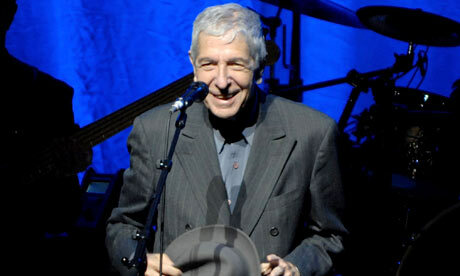 Montreal-born poet-musician Leonard Cohen was named today as the recipient of the Ninth Glenn Gould Prize. The prize is an international award given by the Glenn Gould Foundation which was established in memory of the great Canadian pianist. The general public nominated the candidates and a jury selected Leonard Cohen to receive the award which comes with a bronze sculpture of Glenn Gould by Ontario sculptor Ruth Abernethy, a $50,000 prize and a $15,000 for a protégé of his choice. The jury consisted of Atom Egoyan, Stephen Fry, Gary Graffman, Dadawa, Phoebe Greenberg, Elaine Overholt and Costa Pilavachi. Cohen was not on hand to receive the award, but issued a brief statement thanking the Glenn Gould Foundation. The award has previously been given every three years but now becomes a biennial award. The previous laureates of the Glenn Gould Prize and their protégés were all musicians: 2008 – José Antonio Abreu (protégé Gustavo Dudamel); 2005 – André Previn (Roman Patkoló); 2002 – Pierre Boulez (Jean-Guihen Queyras); 1999 – Yo-Yo Ma (Wu Man); 1996 – Toru Takemitsu (Tan Dun); 1993 – Oscar Peterson (Benny Green); 1990 – Yehudi Menuhin; and 1987 – R. Murray Schafer. Toronto, ON (April 1, 2011) – Singer, songwriter, poet and novelist Leonard Cohen has been awarded The Ninth Glenn Gould Prize. The international award is presented biennially to a living luminary who has made a unique lifetime contribution that has enriched the human condition through the arts and manifests the values of innovation, inspiration and transformation. A tribute to Glenn Gould’s artistry and his multifaceted contributions to culture, the prize promotes the vital connection between artistic excellence and the transformation of lives. "I want to thank The Glenn Gould Foundation for their kindness. It is a great honour, sweetened by my love of the work of Glenn Gould, and our collective appreciation of his invigorating and enduring presence in the world of Music and Imagination," stated Leonard Cohen. Leonard Cohen was chosen from a distinguished list of international candidates nominated by the general public and will receive a cash prize of $50,000 (CDN) and the opportunity to choose an outstanding young artist to receive The City of Toronto Glenn Gould Protégé Prize of $15,000 (CDN). Mr. Cohen and his protégé will receive their awards at a gala ceremony in Toronto and their work will be honoured through a series of public events later this year. Jury Chair Paul Hoffert said, "The jury was unanimous in selecting Leonard Cohen as the Ninth Glenn Gould Prize laureate. His poetry and music transcend national boundaries and cultures by touching our common humanity. His unique voice is nonetheless the common voice of people around the globe telling our stories, expressing our emotions, reaching deeply into our psyches. Like Glenn Gould, his work touches audiences far outside his main genre. Hallelujah!" The illustrious jury for the Ninth Glenn Gould Prize included singer/songwriter, indie producer and UN Goodwill Ambassador Dadawa (China); screenwriter, film and opera director Atom Egoyan (Canada); actor, screenwriter, author and director Stephen Fry (UK); celebrated pianist, teacher, author and music administrator Gary Graffman (United States); film producer, founder and director of DHC/ART Foundation for Contemporary Art and PHI Group Phoebe Greenberg (Canada); singer, educator and vocal producer Elaine Overholt (Canada); and recording industry executive Costa Pilavachi (Canada/UK/Greece). For four decades, Leonard Cohen has been one of the most important and influential songwriters of our time, relentlessly examining the central issues in human experience, and reporting with passion, insight and wisdom. His body of work is a reflection of the zeitgeist of the late 20th century and beyond. His songs are works of great poetic depth and profound emotional force, and set new standards for quality, range and seriousness in pop music. Artists and music-lovers alike are drawn to the dignity, ambition and sheer power of his songs. An accomplished literary figure before he began recording music in the late 1960s, his collections of poetry, including Let Us Compare Mythologies (1956) and Flowers for Hitler, and his novels including The Favourite Game (1963) and Beautiful Losers (1966), had already brought him considerable recognition. His dual careers in music and literature have continued feeding each other over the decades - his songs revealing a literary richness rare in the world of popular music, and his poetry and prose informed by an intense musicality. Collectively, Cohen has published 12 books including Book of Longing (2006), a collection of prose, poetry and drawings which was the first book of poetry to reach the top of Canada's bestsellers' lists, and which formed the basis of a memorable musical and theatre collaboration with composer Philip Glass which premiered at Toronto's Luminato festival. Leonard Cohen is one of the most covered artists alive today, influencing generations of songwriters, and his music has earned the accolades of other artists in tribute albums in France, Norway, Canada, Spain, the Czech Republic, South Africa, and the United States. "Hallelujah", one of Cohen's best-known and best-loved songs has been covered by over 150 artists including Willie Nelson and Bono. Numerous documentaries, awards, and tribute albums acknowledge the far-reaching contribution Cohen has made to music. He continues to refine and deepen his art, and as a musician he is constantly exploring new territory. The Glenn Gould Foundation honours Glenn Gould's spirit and legacy by celebrating brilliance, promoting creativity and transforming lives through the power of music and the arts with the Foundation's signature activities, including The Glenn Gould Prize. Past laureates include Dr. José Antonio Abreu (2008), founder of El Sistema, Venezuela's free music education program for children and youth, Pierre Boulez (2002), Oscar Peterson (1993) and Yo-Yo Ma (1999). For more information on the foundation, prize and jurors visit www.glenngould.ca .